Adding a bit of gold to a batch of molten glass in 1612, Italian glassmaker Antonio Neri discovered the secret required to produce "wondrous red glass that shimmered with the natural beauty of rubies," according to information provided by a Cranberry Glass World article formerly published online. 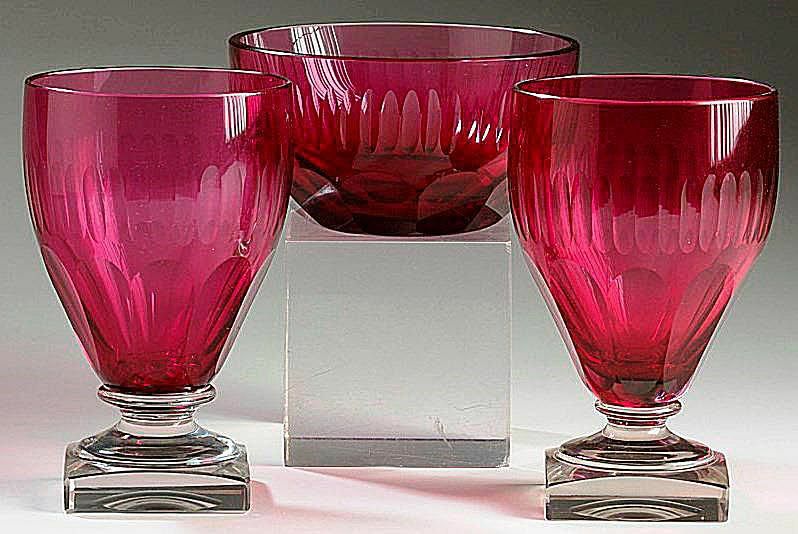 The online Glass Encyclopedia offers a conflicting explanation on the origin, noting the "recipe" for red glass had been lost for centuries and then rediscovered in Bohemia during the 1600s. They go on to say that Venetian glass makers had tried to make red glass unsuccessfully for years. These types of contradictions often come into play in the world of collecting. Since we're looking back through centuries of information, researchers often have a hard time pinpointing exact dates and origins of some of today's most popular antiques. Regardless of the true origin of its discovery, there are a couple of facts everyone seems to agree upon. Cranberry glass does indeed use gold chloride in its manufacturing process, and the Romans made the famous Lycurgus cup of red glass, cranberry's cousin, way back in the fourth century. The amount of gold chloride used intensifies the red color, but it is basically the same process. When looking at antique glassware available to collectors today, it's fairly natural to focus on the Victorian era when cranberry glass comes to mind. During the mid-1800s through the end of the 19th century, glassblowers refined the art of making cranberry glass to create everything from vases and pitchers to decanters with matching tumblers. Some of the rarest and expensive items found from this time period take the shape of beautiful lamps and other lighting fixtures. It's fairly common to see these types of decorative items in stage and screen depictions reflecting this bygone era. When it comes to actively collecting this glass, newer pieces made in this tradition prove far easier come by. While Victorian cranberry glass still graces the shelves of antique shows and shops in limited quantities, it's much easier to find newer items these days. Pilgrim Glass Company produced beautiful cranberry glass items sold in department stores and gift shops around the country up until 2001. These mouth blown pieces ranged from various vases and baskets to candle holders, and at the time of the company's closing cranberry was its most popular type of glass. Until 2011 Fenton marketed new cranberry glass through retailers around the United States as well. The opalescent decoration featuring the popular hobnail, coin dot, and daisy patterns, along with numerous other styles that were made by Fenton for more than 100 years still attract collectors even though the company is now out of business. Even folks who don't "collect" enjoy owning some of these colorful pieces when they compliment a decorating scheme, but now they have to turn to the secondary collecting market to find them. While the newer glass pieces aren't technically reproductions, they can be confused with older glass by collectors and novice dealers. This is especially true with Fenton pieces made during the 1940s and '50s prior to when the company began marking its glass. Even up until the early 1970s these pieces were marked only with foil stickers, which often wore away with cleaning and use. In 1973, Fenton began identifying its glass with an oval mark molded into the glass. Investing in a good book like Fenton Art Glass Patterns 1939-1980 by Margaret and Kenn Whitmyer for Collector Books will help with dating Fenton pieces. Not only is this resource a good tool for research, the book is chock full of color photos to entertain glass lovers as well. Whether old or new, cranberry glass has never been easy to manufacture. A slight mishap in the formulation would muddy a batch of glass and render it useless. "Gold ruby" glass, as these wares are known in Europe, still gets the same hand blown or pressed treatment it did more than 100 years ago. In fact, Cranberry Glass World indicated as many as 26 skilled artisans being involved in the production of one piece of Fenton glassware in the process from blowing to finishing. In the finest glass, no ash, chips or unpolished markings should be visible. This includes the pontil, a rough spot on the bottom of a glass piece that looks broken and chipped when not polished. All blown glass items have a pontil where the finished glass separated from the blowing rod after completion. In a nicer glass, the pontil will be polished smooth. Noting some bubbles and striations indicates a mouth blown piece, but they shouldn't be overly large or interfere with the design of the glassware. Pieces that are hand molded should be relatively smooth showing minimum mold lines or marks. The points where one piece of glass attaches to another, as in a pitcher or basket handle, needs to be smoothly polished and clean. Whether you prefer simple lines or ornate craftsmanship, there's a type of cranberry glass for every collector. When you notice a piece sparkling exceptionally bright, there's extraordinary history, craftsmanship, and a touch of lovely gold behind all that glimmer.